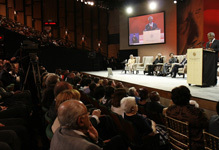 After Mr Kofi Annan’s speech, members of the invited audience streamed outside Wits University’s Linder Auditorium, most seemingly impressed with his views on African development. The tone of the event was simple and understated sophistication, rather than stuffy and officious. The Grammy Award-winning Soweto Gospel Choir led the 1500-strong invited crowd in the national anthem and closed with again with song. 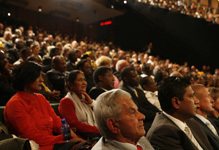 Black and red were the most popular colours in the audience, with suits and jackets more dominant than traditional attire. Mr Mandela himself said self-deprecatingly, “We do not think that our name adds anything to the occasion.” He joked that the audience were only attending “to see what an 89-year-old looks like”. There to welcome everyone was vice-chancellor of the University of the Witwatersrand, Professor Loyiso Nongxa, who welcomed Mr Annan, back “home”. 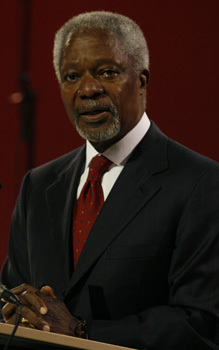 However, it was Mr Annan’s candid speech that proved to be the main attraction. After the speech, the assembled dignitaries were mostly complementary. Former Pan Africanist Congress leader Dr Motsoko Pheko said: “The lecture was very educative and was relevant to Africa’s needs. We need to get assistance where we can, but as a Pan-Africanist, I believe we must do some things ourselves. There is only one Africa, and any instability that affects any country in Africa affects us all. “The message I got today was that Africa has issues to deal with by ourselves,” said director of accounting firm KPMB, Mr Sikkie Kajee. “We can no longer blame the colonial past for the issues we have to deal with. Mr Annan is certainly no fan of Mr Mugabe!